Is the New York Post living in the past, or are their photo researchers too lazy to actually look at the photos they buy to use as story illustrations? 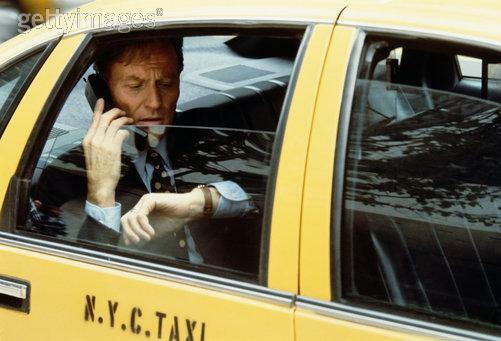 For a story headlined "Ticker Shock at Real Taxi Hike," the Post dug up a stock photo of a "businessman" in a taxi talking on a cell phone. The photo was provided by Getty Images and shot by Getty photographer Michael Goldman. It's a legitimate stock photo and I'm sure the Post paid for its use -- in 1997 when the photo was most likely shot. If you look closely at the photo the Post used to illustrate the story, you'll see that the "businessman" in the taxi is indeed talking on a cellphone -- one that's at least 10 years old judging by the size of the phone. Obviously this photo was not shot just for this story. It was probably purchased as an illustration for the story, but the paper clearly states the photo was shot "yesterday." 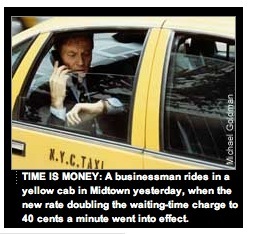 The caption states that the "businessman" is in the taxi waiting in traffic in Midtown Manhattan, as the new rate hikes are going into effect. This is patently untrue. The photo is probably 10 years old. It may very well have been shot in Midtown, but not in this decade. The Post is a tabloid in the very best (worst?) British tradition. It shouldn't be surprising that what they do can hardly be called journalism.